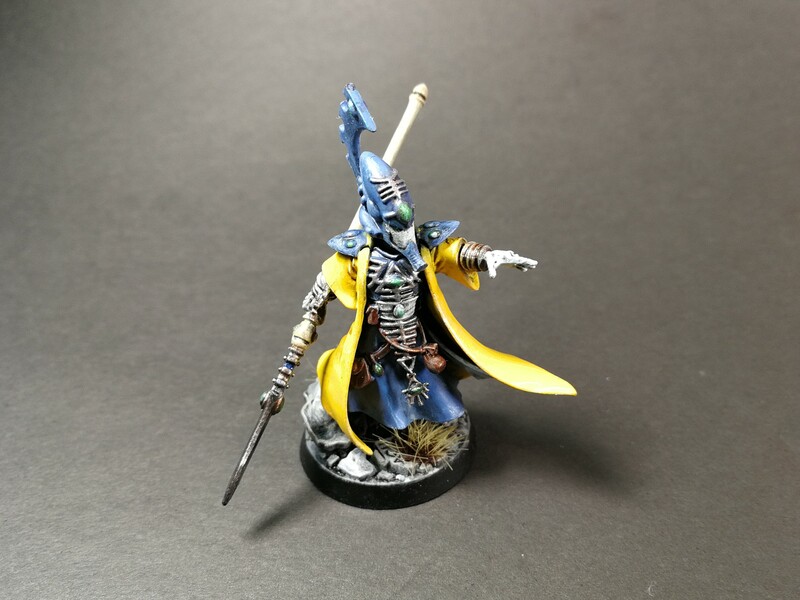 Here’s my recently completed Farseer and over-weathered Autarch disaster! I’ve had around 1250 points of partly painted Eldar languishing in a draw for some time, but finally felt like finishing these. One of the main reasons I’d made no progress with them is that, after doing most of the forces’s yellow, I couldn’t bear to mess it up painting all of the spirit stones. I’d tried to take a shortcut for the stones by using the new Games Workshop technical paints – in the form of Spirit Stone Red – but found that I couldn’t manage to replicate the effects achieved in the demonstrations. I reckon it would be possible to do it better if I worked on it, but I also felt the red wasn’t working too well in general. 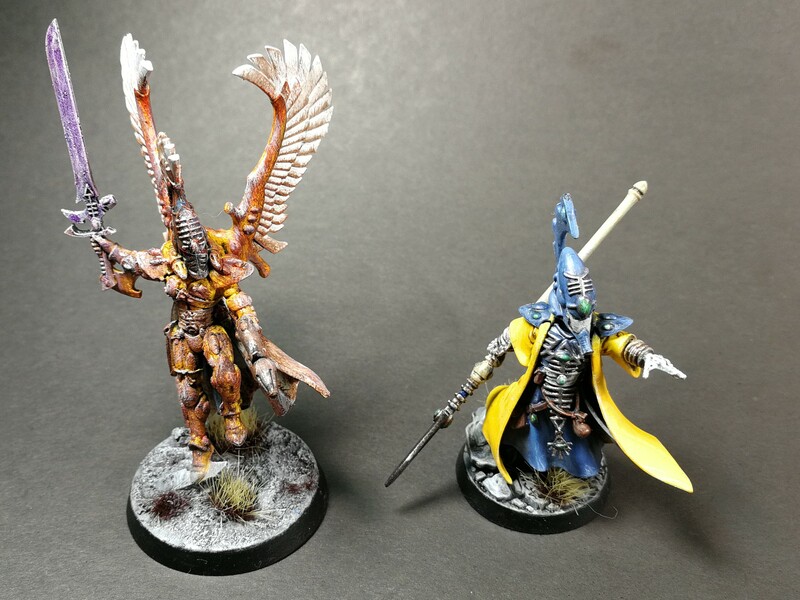 Unfortunately, in a moment of creative uncertainty, I decided that maybe the Autarch (above) could just be weathered into oblivion so that I could avoid painting spirit stones altogether! I started with some light weathering, which didn’t look good. So, sadly, for the white and yellow, I kept going! The Autarch’s kind of a disaster (the photos even seem to make it look better than it is), but it did give me the impetus to finish the Farseer. I’m not great at gems, but I’m much happier with the new understated green spirit stones – painted with Warpstone Glow, Moot Green, Sybarite Green and White Scar (also, thanks new Army Painter Insane Detail Brush). 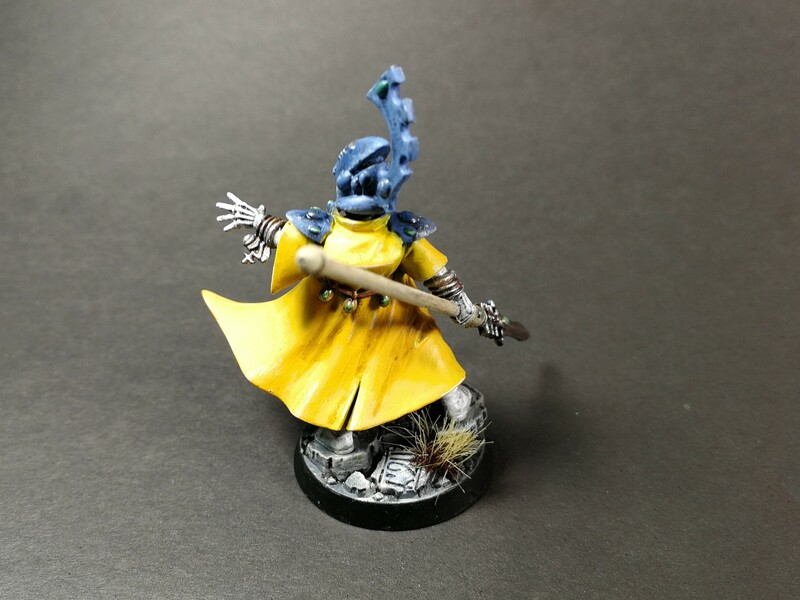 Below is the yellow recipe after priming Chaos Black. It’s been a while since I did this part, so it’s also a bit trial and error – my notes listed all of the colours in order, but not always exactly what I did with each! 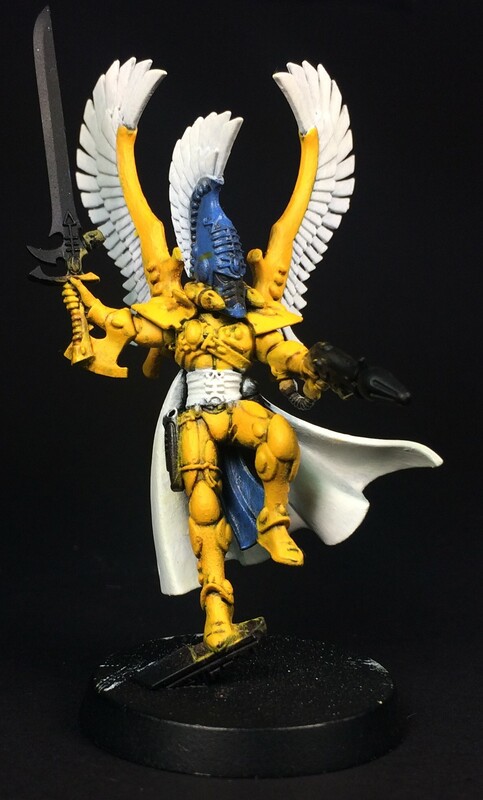 I really like that Autarch mate – it’s a bold look, but I reckon its good! Quite old-school and Blanchian – I reckon a bit of detail work would lift it from ‘accident’ to ‘wilful artistic statement’! You’d have to be a brave soul to do the whole army that way, but would be pretty special.